The benefits of a great speech opening are two fold, it captures the audiences attention and puts both the speaker and the audience at ease. Few emphasize the later benefit of putting both the speaker and the audience at ease, yet its just as important as capturing the audiences attention. In the first 30 seconds of your speech the audience will determine if you are a relaxed and confident speaker, if they believe so they will relax. If not the audience can become uneasy which in turn can make the speaker uneasy. So how do you open with confidence? Follow these 4 steps and you will be opening like a pro. Practice your opening until its word perfect, this will greatly increase your confidence during your speech opening. When you get in front of the audience adopt a positive stance. Stand straight, feet slightly apart with your weight evenly distributed on each foot, shoulders back, chin up and hands away from the body. Capturing the audiences attention is the second benefit of a great opening. 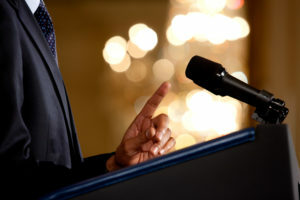 There are limitless options for opening a speech, here are some options, ordered by effectiveness. Think about an interesting fact related to your speech topic, the best option is something that the audience will not know and will potentially startle them. Ask the audience an engaging question related to your topic. “Whats the one change that would that would had the biggest impact on your life” could be used as an opening question for an inspirational speech. Find an interesting prop to capture the audiences attention. An effective approach is find a prop related to your topic but the audience will not know its purpose. You could open by clearly displaying the prop and ask the audience to guess its purpose. The greatest speech are great stories and the best stories open in the middle. Not only is this an effective opening for speeches, this is also used in movies to to pique your interest. If you were to deliver a speech about a person who survived a life or death situation against all the odds. You could start your speech when that person were at their lowest point and it seemed they had no chance of surviving. This will keep the audiences attention throughout the speech as they want to know how did the person get in to that situation and ultimately they want to know did the person survive. For your next speech remember that a great opening is not only about capturing the audiences attention but also to put both yourself as the speaker and the audience at ease. Chooses the right opening for your speech, practice until its word perfect and open with confidence.